© 1994 Yellowstone Association for Natural Science, History & Education, Inc. Yellowstone National Park, Wyoming 82190. 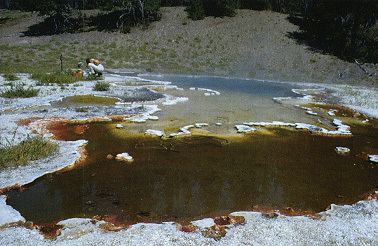 Many of the colorful Yellowstone terraces contain microorganisms capable of using light energy for growth. The mat above, in a side-channel of Octopus Spring (White Creek area) is a typical example: The photosynthetic organisms in these mats produce slimy glue-like materials that keep the cells of the mat together. As the mat grows, the cells underneath become shaded and are no longer able to grow. They are replaced by other bacteria capable of surviving in the dimmer light. The photo on the left (below) shows a core taken through one of these mats. The principal organism in the thin top dark-green layer is Synechococcus (center photomicrograph) and the orange bottom layer is Choroflexus (right). 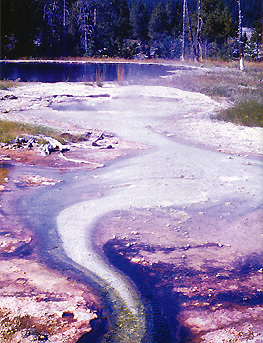 In the photo below, the hot spring run-off channel shows the "V" shaped pattern of a microbial mat near the upper temperature for photosynthetic life. In the white area there are no photosynthetic organisms but only nonphotosynthetic bacteria. As the water cools, the organisms grow better, so that the mat becomes thicker and the colors darker.